How do you illustrate a Braille book? With tactile illustrations, of course! Tactile illustrations are raised pictures that can be explored by touch. They can be general or detailed, but it always helps if there is a Braille description under the picture. This picture, for example, represents a bike. 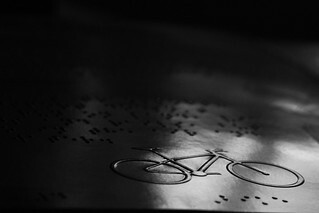 The shape of the bicycle is raised and there is the word "bike" written in Braille under the picture. When you start learning Braille, you need lots of practice. It's best to start with big Braille cells and learn to recognize letters and symbols there and then move on to smaller cells before finally learning to read Braille properly. This process is also known as acquiring pre-Braille skills. When I first started learning Braille, I made myself a Lego Braille cube to gain some pre-Braille skills. 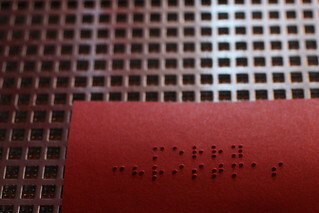 However, there are also simpler ways to make practice-Braille cells. A few days ago I was cleaning up and I found this little Braille learning cube. I made it myself. 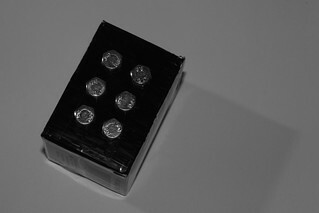 I used a small cardboard box (dimensions: 7x5x5 cm - I got the box when I bought glucose testing strips) and 6 small bolts. I made 6 holes in one side of the box and stuck the bolts in them. The bolts can be taken out and put back in, forming Braille characters in the process. It's a great little pocket device for practicing Braille.